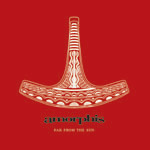 Amorphis - "Far From The Sun"
Amorphis are a 6-piece Finnish melodic metal band. The band's roots go back more than 10 years and this is the bands seventh CD. The band have really moved up to the big league with signing to EMI-Virgin now. The band is in the top 10 in Finland and 20 in Greece. For me, Amorphis have produced some fantastic songs and tracks on all their CDs but they really are stuck in a rut, with their last records all sounding too much alike. This CD is perhaps the bands most melodic and mellow ever with some totally commercial songs like "Evil Inside". There are some folk rock influences and of course a little Kingston Wall here and there. There are some really excellent tracks and the band does some cool mid-song breaks that get psychedelic or experimental here and there, but in the end when you have heard the whole CD all the way through you will find it hard to recall a specific song... it all becomes one, the same way the Gathering has done for me on some records. If you compare this to the new Metallica, this one has much better songs! For more information you can visit the Amorphis web site at: http://www.amorphis.net.